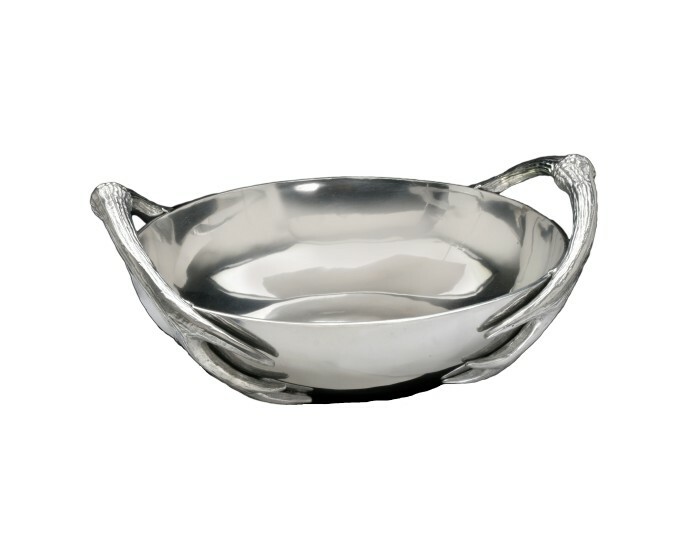 Arthur Court, Antler Large Bowl 15"
Nielsens Gifts Home Shopping Cart Page > Arthur Court > Antler Collection > Arthur Court - Antler Large Bowl 15"
Give your serveware an intriguing, rustic appeal with this Large Antler Bowl from Arthur Court. Antlers merge at the burr on each side of this piece, looping over the bowl to create sturdy, textured handles. The distinct lines within each beam and point stick out against gleaming bowl in this handmade, aluminum design. Size: Diameter: 15.0" / Height: 6.0"